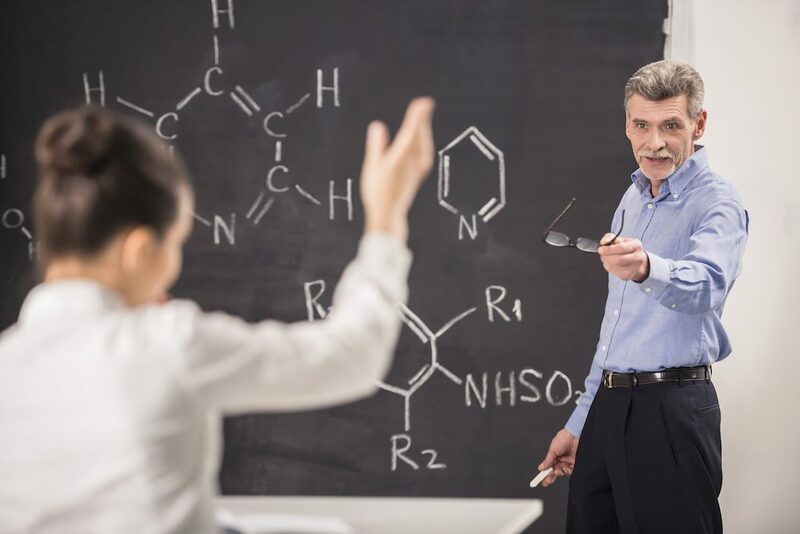 One of the questions we are repeatedly asked at StudyOrgo is “how do I to get ahead in organic chemistry this fall semester?” Many of you have heard that organic chemistry is a brutal class that does little but to depress your GPA. While it is true that this course is challenging, we here at StudyOrgo are devoted to helping you get the “A” you deserve! Organic chemistry gets a bad name because it assumes that you are experts with regards to all of the general chemistry from freshman year, and you are now responsible to know it! 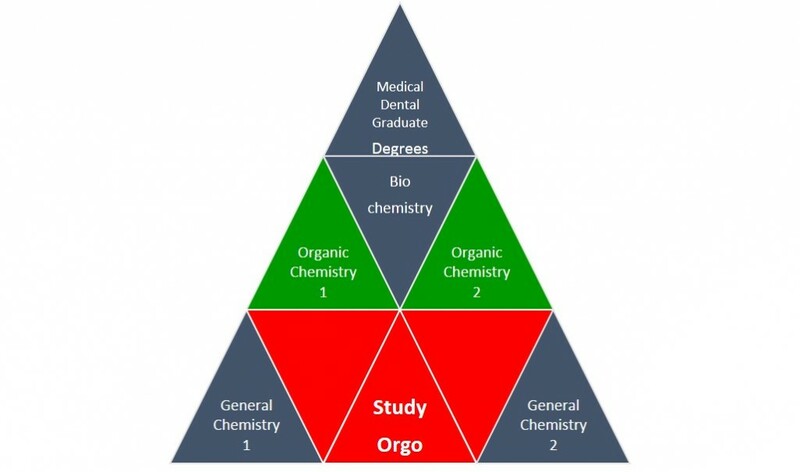 As an analogy, think of your chemistry courses as a pyramid to reaching your degree goals. Organic chemistry is directly placed in the middle of the pyramid, it will be very important not only for the MCAT or DAT exams, but also for future advanced courses. Organic chemistry is supported by General Chemistry, which is why you took it last year. Fortunately, StudyOrgo is placed in the center of your pyramid base and we are here to help all of your organic chemistry questions. Our simple and clear-cut explanations of reaction mechanisms and concepts will easily help you with anything you might struggle with this semester. Here are a few tips on how to prepare today for the course this Fall. Open your text book –Read the title and abstract on the first page of each chapter and check out the number of pages. It will give you a very quick idea of what you will be learning about in each chapter and how much material you will be covering. Look at a syllabus – Remember, your syllabus is an official contract between you and the professor. They must disclose what you are required to learn and how you will be graded. Professors can remove requirements but cannot easily add them. Use this to your advantage! Highlight the contents or reactions of the book that will be required and use this to focus your attention on while studying over the semester. Schedule your studying! – Now that you know where the book is and a rough idea of what you are responsible for learning from the syllabus, take a calendar and divide the time you have to each test by the number of chapters. Schedule 2-3 hours a week to study and DON’T SKIP OR RESCHEDULE. Think of it as a doctor or dentist appointment – you just have to do it! Also, if you plan your studying ahead, you will be less likely to schedule something that gets in the way because you will already have penciled it in! Use your Smartphone calendar to send you alerts and reminders for your studying appointment. Read ahead – If you have time this summer, read at least two chapters to get yourself ahead of the class. Don’t try to understand everything, just pay attention to the words used and the ideas. This will allow you to pay more attention and ask questions about the details in class instead of scrambling to write down notes and drawings. Sign up with StudyOrgo – The Editors at StudyOrgo have spent numerous hours reviewing and preparing the material in the most crystal-clear and “get-to-the-point” manner as possible. We consult students and ask for their opinion on whether they understand the material as presented. We provide quick descriptions and in-depth mechanism explanations. Many of our reaction have multiple examples, so you can learn and then quiz yourself in our website! For the student on-the-go, we have also developed a mobile app (iOS and Android) provides all the functionality of the website! All of these benefits are included in your StudyOrgo membership! With a little time management and help from StudyOrgo, you will have no trouble getting an “A” in Organic Chemistry this year! One of the most important skills to master in organic chemistry is the ability to assign stereochemistry. We at StudyOrgo have devised clear cut explanations of these difficult concepts for students to maximize their time studying and learn difficult concepts quickly and easily. Sign up with StudyOrgo.com today for all of your organic chemistry studying needs! Chirality is an important aspect of life. This is so because many of the basic molecules used in living cells, in particular amino acids that form enzymes, are also chiral. Chirality imparts asymmetry on our molecules, allowing them the ability to recognize “handedness” and further add to the complexity and specificity of reactions. As organic chemists, we must pay constant attention to the chirality of molecules both before and after reactions, less the compounds lose their biological or chemical activity. Chirality is defined as any object in which the mirror images are not superimposable. A good example is your hands; they are mirror images but not superimposable. 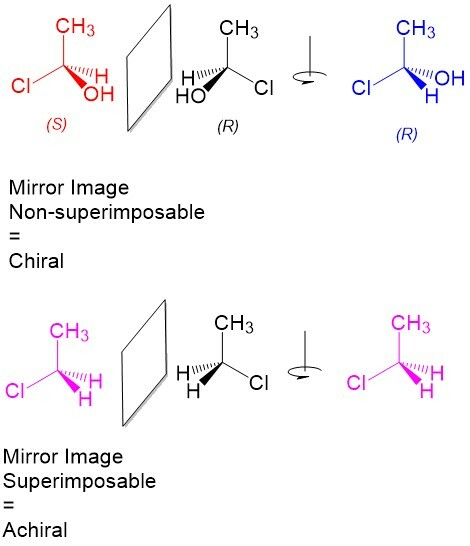 Translating this to organic molecules, a stereocenter is a carbon center with 4 unique substituents that are arranged such that the mirror image is not superimposable. Thus, they “look” like to different molecules although they have the same substituents. If we alter the arrangement of the substituents, we can always come up with 2 arrangements for each substituent, R or S configuration. 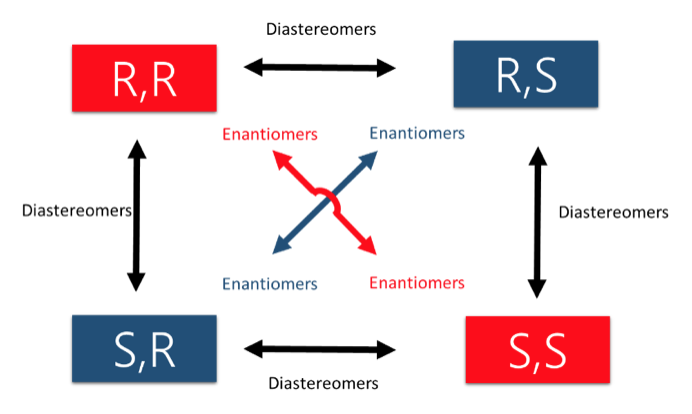 Thus, each stereocenter must have 2 stereoisomers. In order to determine whether the sterecenter is the the R or S configuration, there are a series of steps to follow. Assign priority based on atom atomic number, highest (1) to lowest (4) weight. 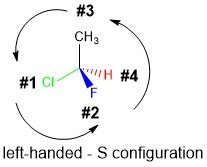 Rotate the molecule so that Priority 4 atom is in the hashed wedge position. Determine the Priority sequence 1-2-3 rotates to the left (S) or the right (R). Let’s consider the biologically active form of testosterone, 5-DHT which is shown below. We indicate that it has 7 stereocenters in the molecule. Applying the 2n rule, we calculate 128 possible stereoisomer combinations. That concludes that while testosterone has 1 enantiomer, it has 126 diastereomers and remember…only 5-DHT works on our bodies!